In two previous blog posts I expressed some thoughts on why I believe the skeptical community needs to develop some basic messaging for the movement, and how they might go about doing so. Now, having presented those thoughts, I figured I might as well go ahead and take a stab at creating a message platform as an example of what I’m talking about. I am not, absolutely not, suggesting that this is the actual set of messaging the skeptical community should adopt and use. My intent is simply to create an example of what I’m talking about, based on my own particular point of view. An actual message platform that had any hope of widespread use would be created through the kind of process I outlined in part two, and would involve the collected wisdom and input from a wide range of individuals. Now, just a few words about what a message map is and what it is not. It is not an attempt to dictate opinions to anyone or to wallpaper over differences of opinion. Rather, it’s an attempt to identify common ground for everyone in the movement, from which they can easily move to their particular position on any subject. It is an attempt to help define the movement positively so that others understand what the skeptical movement is all about. Skeptics believe that the world we live in is explainable and understandable through science and reason...and that that is awesome! That statement summarizes my philosophy as a skeptic - I’ve even added it to the boilerplate on my blog. it’s not as poetic as I’d like it to be, but it’s a positive statement of my worldview. I’m sure many skeptics would word this very differently, or would stress different salient points. But that’s why you bring a group together to talk it through - each word in a statement like this should be carefully weighed and selected or rejected because of its ability to communicate truth. The four areas I chose to focus on for further definition are science, education, woo and religion (not any definitive list, of course, but those seem to be the four areas I have most of my skeptical discussions about. In each, there’s a core statement that relates back to the center, as well as some support statements for that area. If a friend wanted to make a case for homeopathy, I could (as I often have) mockingly point to the glaring weaknesses of the concept, immediately putting him on the defensive. Or, using the map, I could say something like “you know, I’m a believer that science can pretty much explain anything.” He’d agree, presumably. “My problem with something like homeopathy is that, since it is not backed up by science, people are spending a lot of money on it that they could put to better use and, more importantly, they may be staying away from treatments that would actually do them some good (woo).” Then I would go on to talk specifically about why homeopathy is nonsense...but hopefully I've established the basis of my opinion to begin with, which makes it more likely that he’ll accept my specific criticisms of his pseudo-scientific belief. Or let’s say my local school board was considering the teaching of intelligent design in our high schools and I wanted to make a speech opposing it. I could just rip into intelligent design as warmed over creationism (which it obviously is), but I would risk immediately losing my audience since it’s likely to be largely made up of believers of one sort or another. Or I could fashion a speech that begins with my philosophy that the most awesome truths in our world are revealed by science (middle bubble), talk about why it’s important that we use the scientific method to improve life for people on the planet (science), and then move on to how we fail our children if we do not teach them the best and most up to date science (education). Presumably most people in the room are going to agree with some or all of that, and I haven’t even touched on creationism yet. I can move on to that now, but in the context I’ve established, not as an attack on religion itself. The problem with this last scenario is that the reporter, of course is looking for conflict. If you don’t give it to him or her, you’re probably not going to end up in the story at all. But that’s another issue entirely. Anyway, that’s enough about that. 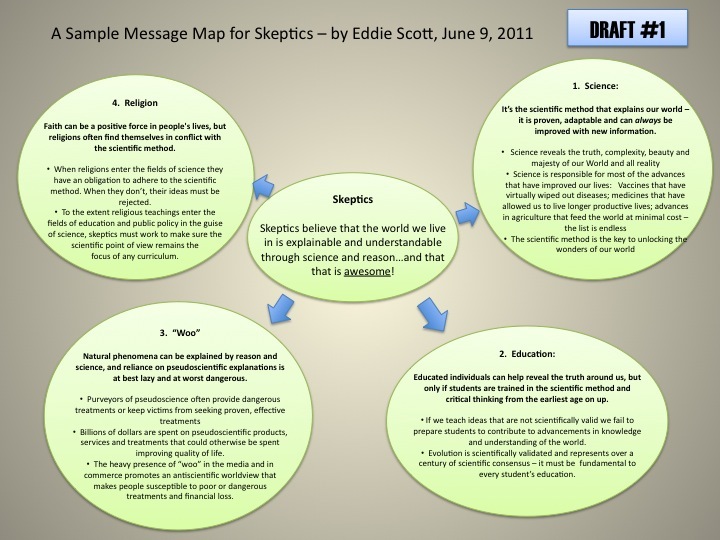 As I said several times, these are just my thoughts on the subject, and the message map I created is simply my work. I’d love to see a situation where the leaders of the skeptical movement could come together and develop something along these lines that would benefit the rest of us as we try to carry the skeptical message forward. A Jack Mormon on "The Book of Mormon"